I’m going by the old saying ‘Feed a cold, starve a fever’ and I think it’s working. I’m no longer sneezing or bunged up and I’m coughing much less. I do feel tired though. 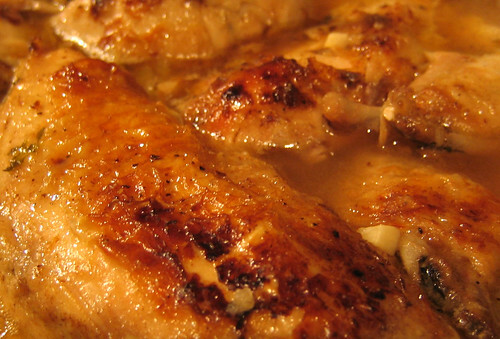 I wanted soothing food today and chicken casserole seemed the way to go – chicken has to be the perfect food to feed a cold. But is there actually anything in that saying? Does it actually work? Well, back in 2002 Dutch scientists conducted an experiment to find out exactly that. The results of the experiment showed that eating a meal boosts the type of immune response that destroys the viruses responsible for colds, while fasting stimulates the response that tackles the bacterial infections responsible for most fevers. But Gijs van den Brink, who worked on the experiment, cautions that that people should not change their behaviour based on such a small study. Well maybe not, but it’s my excuse and I’m sticking to it.